Cat behavior can often seem strange to us and some of it drives us crazy. However there is always a reason behind the behavior and often it is triggered by the cats own natural instincts or reactions to the world around them. Before we start I must say one thing. It is important to remember that a cat is a cat and not a human. Can You Discipline A Cat? Purring - What Does It Mean? Now this may sound obvious but many people expect their cats to react in the same way a human would. This is simply not the case and once you begin to think like a cat, their sometimes strange behaviours will become more clear. It will also help you resolve some of your cat behaviour problems. Unfortunately some natural cat behaviors can cause problems in the home and this is when owners need to have patience and understanding in helping their feline friend through difficult situations which could be triggering the behavior. Lets take a look at one of the most common reasons why a cat may behave in a destructive manner For instance, scratching the furniture, meow a lot or even over eat and become fat. Many cat Behavior problems arise simply when an animal is bored or frustrated. This is especially true of indoor only cats. It is essential to make sure that your cats environment is stimulating. This can be easily resolved by providing things like an indoor kitty tree, climbing post, lots of toys or a ‘kitty gym’. 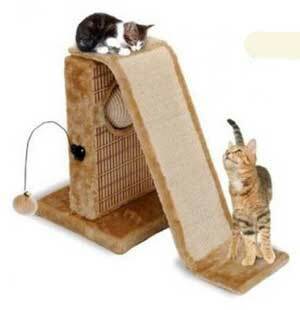 There are many online retailers now such as www.catsplay.com where you can find whole ranges of cat furniture allowing you to create a veritable kitty adventure playground! Why Do Our Cats Hunt Even Though We Feed Them Every Day? The cat hunting instinct is strong and remains in our domesticated cats. But to us owners it can be rather upsetting to find dead mice and birds left on our doorstep,especially if they are well chewed. There is not much we can do to stop this behavior but if you understand more about it perhaps you will be able to except it more easily. Please see my page about the hunting cat behavior for more information. 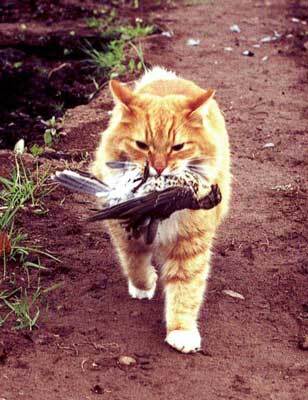 Do you think the Catbib can stop your cat from killing birds? This has to be one of the most distressing and annoying cat behavior for many of us, Especially if we have a cat who does this frequently, ruining carpets and soft furnishings. However unless the cat is ill and can't help it, this behavior is usually triggered by the cats natural instinct to scent mark their territory. But doing it in the home is extreme and is normally caused by some anxiety the cat is experiencing. Please see my pages about why this may be happening and how you can put a stop to it. Whether it be fighting with the neighbours cats, between siblings or other family cats or pets or even towards us, aggressive cats are a problem. However there is no one reason for any of these situations and they must be approached differently. Sudden aggression towards us or other pets in the home could be caused by what is known as aggression trauma and can be brought on my some traumatic recent experience such as a visit to the vets. For more information please see my page about aggression trauma. 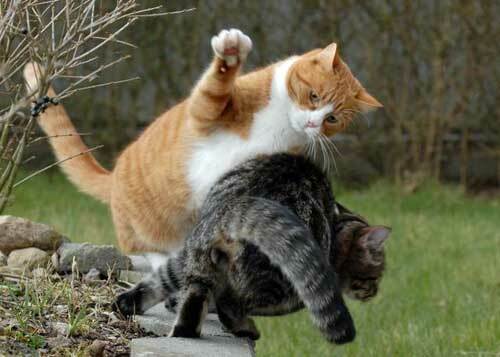 General aggression is often a learned behavior and is often associated with cats who have been abused or have not had the benefit of being brought up with their mother or siblings. We humans can also have a hand in promoting this behavior, although we are probably unaware that we are doing it. Please see my page about aggressive cats to find our what can be done to turn this behavior around. 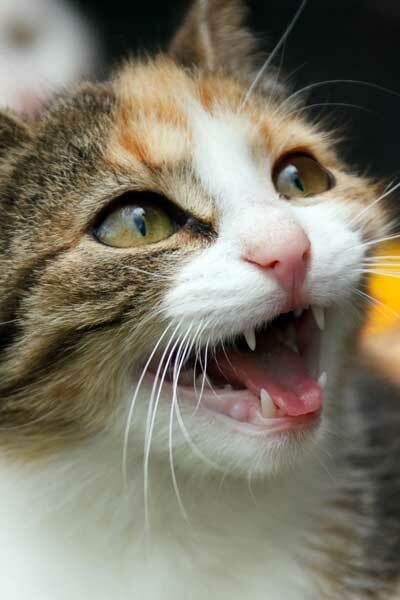 Cat Bites - Have you ever wondered why a pet cat will sometimes bite for no apparent reason? Find our why here. Understanding a cats body language can help us to avoid being bitten. Learn how to read your cats signals here. I think every cat owner has suffered this problem at least once. I know some of my furniture has signs of a claw attack. As mentioned above this is mainly due to boredom but it can also be triggered by new furniture coming into the house and the cat wanting to mark it in some way. It may also be caused by the cat simply not understanding the rules of the house. yes It's true some cats need to be trained not to sharpen claws on furniture but to use their scratching posts only. Please see my tips on how to stop cats scratching the furniture here. 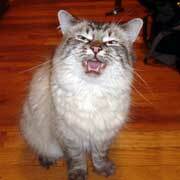 You wake up bleary eyed in the middle of the night, the cat is loudly meowing outside your bedroom door again. Does this sound familiar? Again unless your cat is ill in some way, this cat behavior is a learned beahvior often for attention. unfortuanely cats do not keep the same social hours as we do and unless we can set up a routine at night for our cat, we will continue to be woken in the small hours. To find out more about cat meowing, the causes and how we can temper this annoying behavior, Please see my page about cat communication. Every cat has its own individual personality. Some may be very outgoing and love to meet and greet new people while others seem to be afraid of everything and hide away at every opportunity. Of course family genetics plays a part but life experiences can play an even bigger part in your cat behavior. 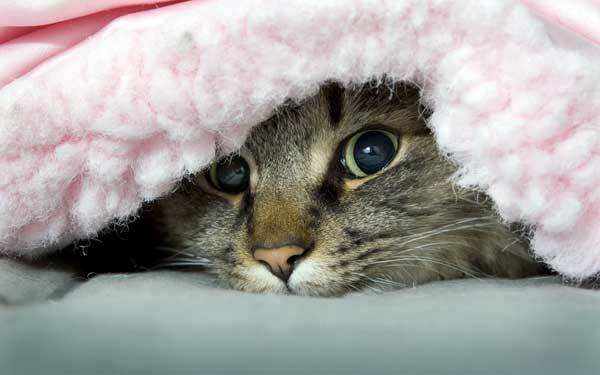 Find out more about Shy Introverted cats Here. unfortunately not all cats get a great start in life and this can cause them to react badly to the world around them. There's nothing worse than seeing your pet constantly hiding away or shying away from human contact all the time. 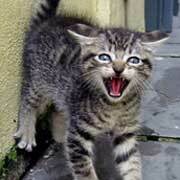 Some cats are just more fearful than others, especially to things like loud noises and new people or animals. In both these cases there are several things that can be done to help reduce your cats anxiety and help them lead a happier life. See my tips for scared cats here. Unlike our children cats cannot be disciplined in the same way, they simply won't understand what is happening. Humans when angry or afraid will shout or lash out in some way. Both of these will simply frighten your cat and instead of correcting the behavior will simply make them afraid of you. However there are ways you can teach your cats about good and bad behavior without reverting to these basic forms of discipline. For advice on how to do this please see my page about cat discipline here. Understanding our cat behavior is very important. It will not only help us to prevent many anti social cat behaviours but will also promote a better relationship between owner and pet. Many people believe that cats are aloof and selfish, doing exactly what they want when they want. However, cats in the wild often live in colonies, similar to a pride of Lions and can display very social cat behavior to one another. Bonding - The human, cat bond is not always a natural one. For some cats who are new to a home and who may have previous unpleasant experiences with humans, are not always happy to around humans. This can be very upsetting for the new cat owner, who simply wants to love and care for their new feline friend. To find out more about to bond with your new cat and to understand the cats natural social behaviours please see my page here. Clingy Cats - Although we as cat owners love to have a pet who wants to be around us and displays lots of affection towards us, in some cases this can become a problem. 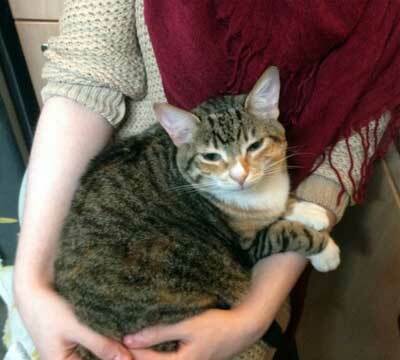 A clingy cat who is distressed when left alone is a unhappy cat and this can lead onto other anti social behaviors such as defecating in the home. If you have a cat who has separation anxiety, I have a page with more information to help you, help your pet. Cats will also show some unusual behavior from time to time. Well It looks odd to us anyway, but in many cases there really is a good reason for it. One of these odd behaviors is eating grass, a behavior that we have all seen. But as odd as it looks there is a reason why our cats eat grass. Find out more here. Cats have many methods of communication with each other. Developed in the wild, these sounds and actions have far more meaning than mere meowing for the pleasure. The signals range from very obvious direct ones, to subtle gestures we may not notice, but which send very definite messages to other cats. 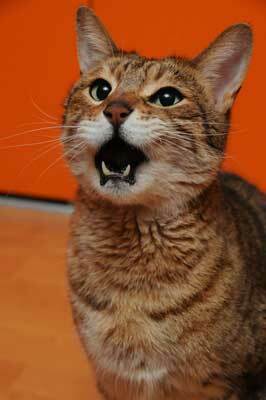 Hear some examples of the different sounds a cat can make. They can be very vocal at night time, which is the normal time for cats to be out and about hunting or looking for mates. However it is thought that cats have also learnt to be more vocal with us, perhaps copying our own verbal communication, in an attempt to try and get us to understand what they want. I know many cats that make different sound for when they want to go out or want feeding etc. Purring is another form of communication. 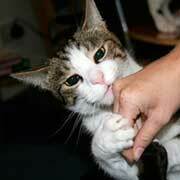 To understand why cats purr please see this page. The cat's sense of smell, touch and hearing are the most important senses they have, and cats use them far more keenly than humans. They also use body language to communicate many emotions, from fear and aggression to pain and contentment. Smell: Cats have a special organ in their nose called the vomeronasal organ, which helps them to detect smells. You may have noticed your pet slightly opening their mouth when they have smelt something new, they are using the vomeronasal organ when they do this. Scent is also an important communication method. They identify each other by smell and also use it to mark out their territory. Cats have scent glands around their mouths and also their feet. That is why you may see your cat rubbing its face around furniture or people; they are just marking it, to say that it belongs to them. Body Language: By understanding your pets body signals you will notice when they are not feeling well, if they are afraid of something, or are generally not in the mood for a cuddle and would just rather be left alone. A cat's face will give a lot away; if the pupils of the eyes are wide this will indicate either a scared or angry animal especially if they have a fixed stare. Or it could mean that they are quite excited about something. Their body language will also help to clarify their emotions. Ears folded back means aggression while completely flattened against the head means that they are really scared. 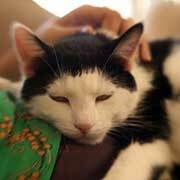 Ears pricked up and held slightly forward means that they are confident and a happy cat. By watching and listening to our cats more closely we will gain a better understanding of their needs as well as their delightful social interactions with us. It may even help to alert us to when our cats are feeling unwell. A subtle change in cat behavior can often be the first indication that something is wrong.